In addition to our Children and Worship program, we have put together something for kids to do while waiting for worship to begin and during the time they are in the service. Just to the right of the sanctuary doors is a small white shelving unit we call the KidZone Activity Center. Here your kids will find coloring pages, work pages, crayons, pens, white boards and erasing cloths, stickers, finger puppets and plain paper to draw on. There are also clipboards to give them a flat surface to attach their papers to and colored cloth bags if they want to put their things in something to carry into the sanctuary. Your kids can use anything they would like and then, at the end of the worship service, we ask that they return everything as neatly as they can to the shelving unit and take any of their finished papers home. 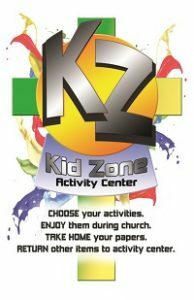 We hope your kids will visit the KidZone Activity Center the next time they come to a worship service at GPC.